According to the Chairman of the Motor Industry Workshop Association (MIWA), Dewald Ranft, while the motor repairs industry has traditionally been seen as a male-run industry, women are in fact the backbones of most businesses. “A large majority of independent workshops employee women to engage with customers, handle the administration and human resource functions as well as the ordering of supplies and so on. Many of these businesses start as family-owned businesses so mothers, wives and daughters all get involved,” he says. In honour of Women’s Month, Ranft believes it is important to acknowledge and celebrate the role that women play in the sector. “There are so many women who play not only support roles, but own and run workshops and franchises, and there are also women who are trained as mechanics. We salute you all." One such woman, Frieda Burton, administers the head office and national marketing administration for Car Care Clinic as well as two of the company’s owner branches. She also oversees 10 franchisees. The company is growing and the plan is to open two new branches this year. Her son, Louis Scholtz, started the business in 2012 in Centurion, Pretoria, and called on her to get the administration side in order and to train staff. The rest is history, as they say. Andrea Bogner, the owner of Bogner Motors in Johannesburg and the Chairperson of MIWA’s Highveld Region, recently summited Kilimanjaro in an effort to raise funds for eight needy causes. She took over the business when her father passed away unexpectedly several years ago and has grown the business receiving various accolades over the years. She is also a motivational speaker, does team building and is involved in various charity initiatives. 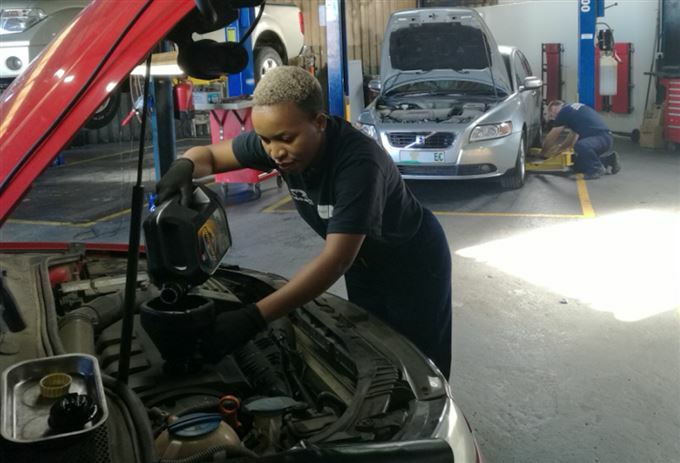 It's not often that you meet a woman mechanic but Lungakazi Langa has proved she is a professional and is Cliffie Jnr Jacobs’, the owner of Cliffies Auto Repairs in East London, right hand. Having grown up in Lusikisiki (Eastern Cape) and matriculating from Siwali Senior Secondary School, she studied motor mechanics at Lovedale TVET College qualifying with a N1, N2, N3 certification. She started working at Cliffies Auto Repairs in 2016 as an apprentice and a year later was employed full-time. She is currently awaiting a trade test date so that she can become a qualified artisan motor mechanic. “I have always loved cars since I was young even though I didn't have full access to them. There were no cars at home. I told myself that I wanted to make history regardless of my gender. When I am fixing a car, I see myself making my mark as a woman – that’s what I enjoy most. I learn new things every day from working on different types of cars and with the help of my mentors, Cliffie Jnr, and his brother, Chris. Many thanks to them,” says Langa. Ranft thanks all the women in the motor sector for their dedication and skill. “Without you, this industry would not be what it is today,” he concludes.